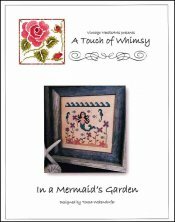 In A Mermaid's Garden [D6727] - $10.00 : Yarn Tree, Your wholesale source for cross stitch supplies. A cross stitch pattern from Vintage NeedleArts. Living in the deep blue sea, mermaid watches as her garden grows! Beautiful purple flowers bloom, as little fishy & seahorses go swimming thru. It's time to dive into summer! Stitch count is 82W x 75H.